Put your Jack O Lantern to work to create the scrumptious scents of Fall. Medium size pumpkins work best here, try to avoid using the real big pumpkins. If the pumpkin is too small to carve just make holes all along the sides with an apple corer or small knife. 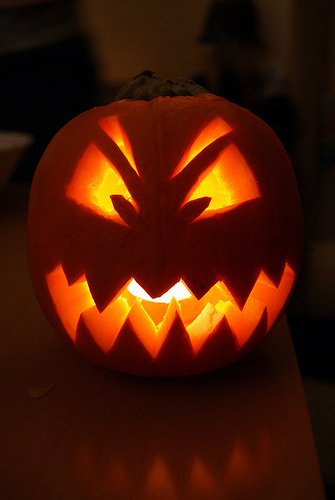 Carve or make holes in your pumpkin and clean out the inside. Sprinkle your blend of spices all over the inside of the pumpkin, use enough to cover liberally. Place a tea light candle in the pumpkin and the spice scent will fill the room!